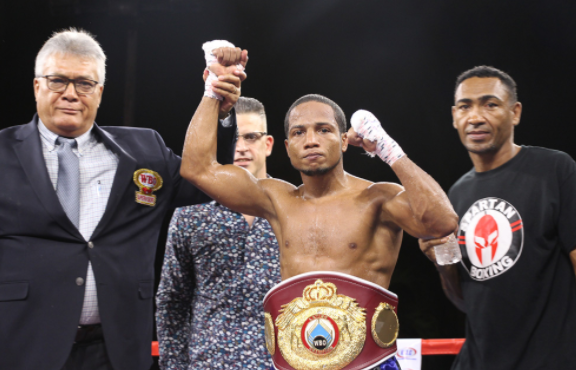 The explosive World Boxing Organization (WBO) Interim Latino Jr. Featherweight champion, Yenifel “El Rayo” Vicente (33-3-2, 25 KOs), of the Dominican Republic, is hopeful that he’ll face WBO world champion Isaac Dogboe (20-0, 14 KOs) of Ghana. “I’m ready for a world title fight against the WBO world champion Dogboe. If we face each other, it will be a Fight Of The Year candidate because of our aggressive styles. We both like to go there and expect a war, and at the same time, we are not afraid of it. What better way than to give the fans an intense war? Let’s do it”, said Vicente, who is ranked number 10 in the WBO. “If I have to fight in Ghana, United States or in England, which is where Dogboe trains, I’m more than available to do it. I still remember the negative comments that the Dogboe team made about the Latinos heading on the Magdaleno fight. That’s additional motivation to fight him. I heard Dogboe is looking for a opponent to fight in December. I’m always available!”, exclaimed Vicente, who trains in Puerto Rico, under the supervision of Freddy Trinidad, and Yoel González at the Caimito Boxing Gym, located in the capital city, San Juan. Vicente has eight wins in a row by way of knockout, which includes the Knockout of the Year in the Premier Boxing Championship over the favorite and then undefeated Juan “Baby Tito” Domínguez, who was knocked out in the 3rd round. In his penultimate bout, held in April in Colombia, Vicente was crowned WBO Interim Latino Champion after defeating via 4th round technical knockout the local Walberto Ramos. Last August, Vicente successfully defended his title by knocking out Mexican Andrés García in the second round in Panamá. Vicente is promoted by DiBella Entertainment and managed by Spartan Boxing Club.